In Hebrew, the word " hanukkah" means "dedication." The name reminds us that this holiday commemorates the re-dedication of the holy Temple in Jerusalem following the Jewish victory over the Syrian-Greeks in 165 B.C.E. Jewish resistance began in the village of Modiin, near Jerusalem. Greek soldiers forcibly gathered the Jewish villages and told them to bow down to an idol, then eat the flesh of a pig, both practices that are forbidden to Jews. A Greek officer ordered Mattathias, a High Priest, to acquiesce to their demands, but Mattathias refused. When another villager stepped forward and offered to cooperate on Mattathias' behalf, the High Priest became outraged. He drew his sword and killed the villager, then turned on the Greek officer and killed him too. His five sons and the other villagers then attacked the remaining soldiers, killing all of them. Once the Maccabees had regained control, they returned to the Temple in Jerusalem. By this time, it had been spiritually defiled by being used for the worship of foreign gods and also by practices such as sacrificing swine. Jewish troops were determined to purify the Temple by burning ritual oil in the Temple’s menorah for eight days. But to their dismay, they discovered that there was only one day's worth of oil left in the Temple. They lit the menorah anyway and, to their surprise, the small amount of oil lasted the full eight days. Hanukkah falls on the twenty-fifth day of the Jewish month of Kislev. Since the Jewish calendar is lunar based, every year the first day of Hanukkah falls on a different day—usually sometime between late November and late December. Because many Jews live in predominately Christian societies, over time Hanukkah has become much more festive and Christmas-like. Jewish children receive gifts for Hanukkah—often one gift for each of the eight nights of the holiday. Many parents hope that by making Hanukkah extra special, their children won't feel left out of all the Christmas festivities going on around them. 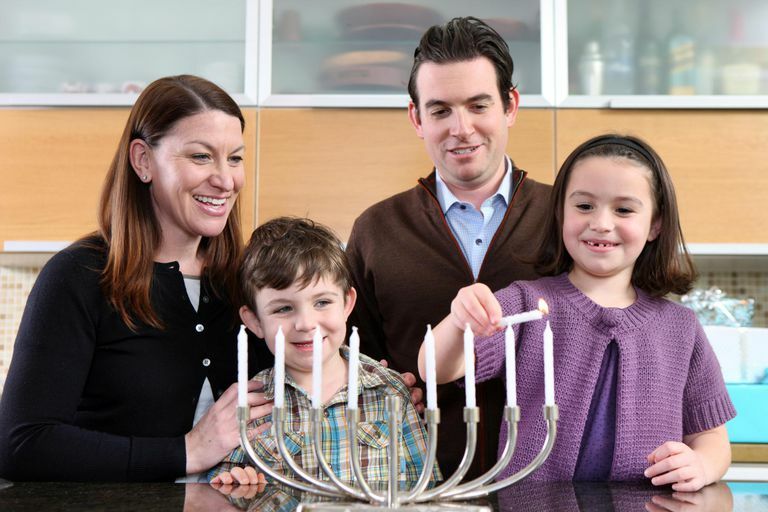 In addition to these customs, there are also many fun ways to celebrate Hanukkah with kids.